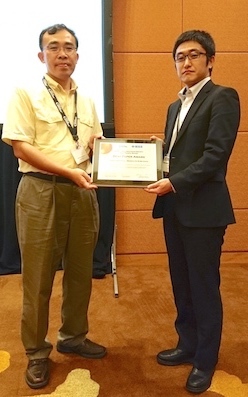 "Relay-by-Smartphone: Realizing Multi-Hop Device-to-Device Communications" on "Sumaho de Relay" that Associate Professor Nishiyama presented in 2014 as the lead author won the 2017 IEEE ComSoc AP Outstanding Paper Award. 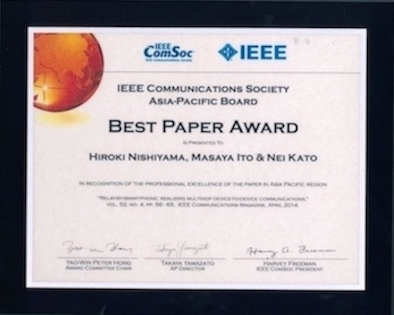 This award is elected based on the number of citations of Web of Science among the papers published in the important journal of the IEEE Communications Society.This paper is a highly cited paper ranked in top 1% of Computer Science's academic field as well. In the research on "Relay-by-Smartphone", he was representatively awarded the Special Prize for Industry and Academic Field in 2015, 29th cutting-edge technologies grand prize pioneering the creativity. The IEEE ComSoc AP Outstanding Paper Award shows that the research have received a worldwide evaluation from academic point of view.